Hepplewhite Corner Cupboard from the collections of the Worthington Historical Society (WHS) may be used for educational purposes as long as it is not altered in any way and proper credit is given: "Courtesy of the Worthington Historical Society, Worthington, OH." Prior written permission of the WHS is required for any other use of Hepplewhite Corner Cupboard. Contact WHS at info@worthingtonhistory.org to request permission. Hepplewhite Corner Cupboard is realia, with genre furniture. Its dimensions are 41 in. x 46 in. x 92 in.. This corner cupbaord belonged to Crissa Johnson Maynard. Crissa was a relative of early Worthington businessman Orange Johnson. Both traveled from Connecticut and settled in Worthington, Ohio. The cupboard is constructed of cherry and walnut with glass panes in each door in Hepplewhite style. George Hepplewhite was an 18th century English furniture maker and designer. His popular designs are documented in the book "The Cabinet-Maker and Upholsterer's Guide", which was published in 1788, two years after his death. Furniture based on his designs is called Hepplewhite. 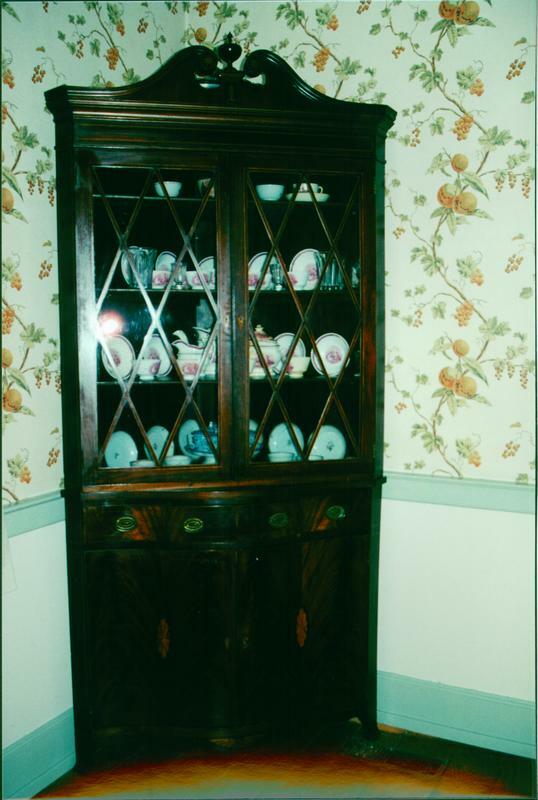 This cupboard is on display at the Orange Johnson House Museum, located at 956 High Street in Worthington. The Worthington Memory identification code is whs0021.